In just two weeks, The FALL of GRACE will be on bookshelves everywhere. It took forever and happened all of a sudden! The idea came in 2015. The writing was done in fits and spurts through 2016. As I worked on revisions, a publishing date was chosen: Spring, 2018. I had tons of time. Near the end of 2017, the cover was revealed. $45 million dollars are missing. Grace’s mother stands accused. A search for answers leads Grace to a mountain in the wilderness of Colorado. Grace is followed by Sam Rivers, a loner from school, who thinks Grace will lead him to the money. To survive the mountain, the two of them will have to trust each other, but what secrets will they uncover once they reach the top? The first advanced reviews hit. But still, there was plenty of time to get ready for the launch. So now I’m in scramble and panic mode. My new book…out in the world! I want to throw a party and I want to give stuff away and I want to dance naked through a bookstore. 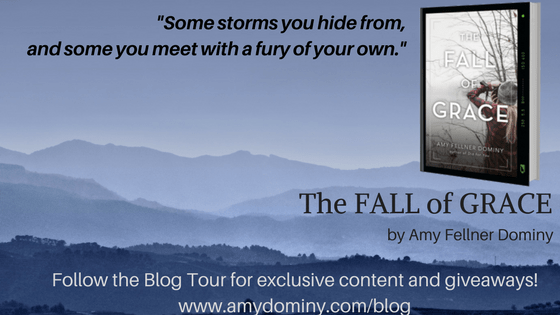 Announcing a Blog Tour and Giveaways! Plus–follow the tour for bonus material from the book including excerpts! The giveaway opens TODAY (March 27th) and goes through the month of April.